The World Bank estimates human activities over the past 26 years have stripped the planet of 320 million acres of trees. This deforestation isn’t confined to remote locations such as Brazil’s rainforests or Alaska’s Tongas National Forest; it’s also happening right here in the Willamette Valley to Quercus garryana, Oregon’s white oak. It’s imperative we act now to save its remaining woodland habitat, and, fortunately, Willamette Partnership, a local nonprofit conservation group, has an important first step land owners can take, signing the Willamette Valley Oak Accord. When missionaries first arrived in the Willamette Valley in 1833, the valley floor and surrounding foothills were blanketed by 400,000 acres of Oregon white oak woodland and savanna habitat. Two centuries of clearing land for homes, farms and cities has reduced that figure to a paltry 28,000 acres, 98 percent of which is located on private property. Dan Bell, Willamette Strategic Partnerships Director for the Bonneville Environmental Foundation, warns the Valley is now at an “ecological tipping” point as oak and prairie habitats face mounting pressure from population growth and land use. From Premier Pacific Vineyards’ “bulldozer blitzkrieg” of the valley a decade ago to more recent clearings by wineries in the Dundee and Eola-Amity Hills, it’s easy to appreciate why Casteel is concerned. Slowing these losses, however, is problematic because of a lack of any state or federal laws protecting the white oaks. The problem is further compounded by the underdeveloped market for the tree’s lumber. 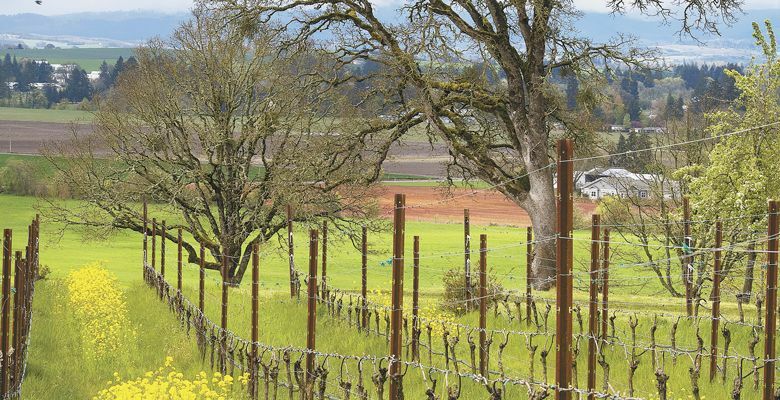 Limited value makes it difficult for private land owners to justify maintaining oaks in the face of more lucrative ventures, such as planting grapevines. When the land is sold, new owners are often told by financial advisers that leaving stands of white oaks in place would be a “bad investment” and maximum cultivation is the way to proceed. Why should we care? First, Oregon white oak habitat provides homes for hundreds of native animal, plant and insect species; several considered endangered. Oregon white oak habitat also improves air quality by sequestering carbon and protects water by preventing rain from carrying soil and agricultural runoff into streams, rivers and lakes. The American Water Works Association estimates each 1-percent loss of forest cover results in a 3.9-percent increase in turbidity, as soil, organic matter and fertilizers are washed into waterways. Communities are then forced to spend millions of dollars for increased water treatment, and the clearing of sediment from ditches, drainage areas, reservoirs and rivers. Add in the negative economic impacts erosion can have on recreational waterway use and fish spawning habitats, and what is clear is how we should be working toward more forest cover, not less. Oregon white oak stands and the understory vegetation they support don’t merely protect against erosion, but also improve the quality of the soil held in place. They do this by boosting water retention, and providing nutrition and shelter for the microorganisms living in and around their roots. Studies also indicate that soils slightly farther away from oak trees are packed with higher concentrations of nutrients when compared to oak-free farmed areas. “The ground is critical to what we do as winegrowers, and we need to start thinking about oak trees as being an important part of the terroir,” Casteel said. Luckily, there’s something the wine community can do to slow or reverse the dangerous course: the Willamette Valley Oak Accord. The new voluntary agreement was born from a brainstorming session involving Casteel, Pat Dudley of Bethel Heights and Nicole Maness of Willamette Partnership. Initially, they discussed strategies to protect the endangered Fender’s blue butterfly, but talk eventually turned to habitat protection in general. 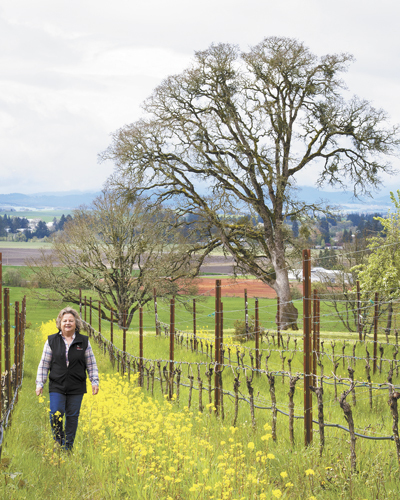 Casteel felt her family’s environmental efforts at Bethel Heights might be wasted if neighbors continued to remove critical pieces of the surrounding habitat in order to expand vineyards. Casteel and Maness soon came up with the idea of a voluntary accord to protect what’s left of the Willamette Valley’s Oregon white oaks. What happens if you sign the Oak Accord? Willamette Partnership will send a qualified biologist to create a baseline assessment of your property. You will receive a copy of the assessment, along with an action plan to help you preserve your property’s Oregon white oak stands. If you find it necessary to remove any oak trees, you will be provided with ideas on how to mitigate the impact, including information about how to offset any losses by participating in nearby oak restoration efforts. After five years, there will be a follow-up assessment to chart your progress. In addition to sharing the assessment with you, this information will become part of a database enabling Willamette Partnership to track the health of Oregon white oak habitats throughout the region. The Accord is voluntary and signatories may withdraw any time without penalty. To protect privacy, information shared with funding agencies or researchers outside the accord will be coded to preclude identification of individual property owners. Signatories who complete the assessment and action plan will receive either a certificate or plaque conveying their conservation efforts to customers and increase awareness of this issue in their community. Signatories also have the option of keeping their participation private. This is all possible with a signature and a modest fee for the property assessment. Thus far, more than 40 wineries, businesses and individuals have signed the Oak Accord, and anyone can support the cause. If you don’t own a winery, vineyard or oak trees, you can make a tax deductible donation to the Willamette Partnership’s Friend of the Oaks program to help support the implementation of the Oak Accord and other woodland restoration projects. Donations in any amount will be welcomed, but a donation of $250.00 will be formally recognized in Oak Accord outreach materials and will include an invitation to a celebration held in a local vineyard. In the Dr. Seuss children’s classic “The Lorax,” the protagonist represents the lone voice defending a forest threatened by economic development. 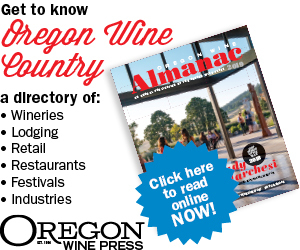 We face a similar situation here in the Willamette Valley, with the wine community in a unique position to help rescue the remaining Oregon white oak habitat. Will we be like the greedy Once-ler, planting vines until the last of the white oaks are gone? Or will we heed the Lorax’s warning and stop while we can? To sign the Willamette Valley Oak Accord, please visit www.willamettepartnership.org, or contact Nicole Maness at maness@willamettepartnership.org or 202-384-8992.